In 1983, Bosma and colleagues discovered an autosomal recessive mutation (scid) in the C.B-17 mouse strain that resulted in marked deficiencies in both humoral and cell-mediated immunities.1 The mutant locus was mapped close to the mahoganoid locus, centromeric to the Ig light chain locus on chromosome 16.2 The mutation appears to impair the recombination of antigen receptor genes. Therefore, mice homozygous for scid (SCID mice) are severely deficient in B and T lymphocytes and are highly susceptible to infections. Subsequently, it was shown that the mutation also affects double-stranded DNA repair in other cells and tissues in SCID mice.3,4 Presumably, the DNA repair enzyme is critical to immunoglobulin (Ig) and T-cell receptor VDJ gene segment rearrangement in lymphocytes5’6 and its absence leads to the failure of B and T cells to express their antigen receptors, and immune function in SCID mice can be fully restored after reconstitution with normal mouse bone marrow.7 In 1988, two methods for the partial reconstitution of a human immune system in SCID mice were described.8,9 McCune and colleagues developed chimeric SCID-hu mice by IV administration of progenitor cells from human fetal liver to SCID mice that had previously been engrafted with human fetal thymus.8 Mosier et al established the hu-PBL-SCID mouse system by IP transfer of human peripheral blood mononuclear cells (PBL) into SCID mice,9 and Kamel-Reid et al and Lapidot et al utilized human bone marrow in different systems to reconstitute SCID mice.10–12 Such chimeric mice present certain characteristics of the human immune system and are being used as in vivo models of human hematopoiesis, infectious diseases, autoimmunity, and tumorigenesis. The majority of studies on human humoral immune response in SCID mice have been performed in the hu-PBL-SCID mouse model. 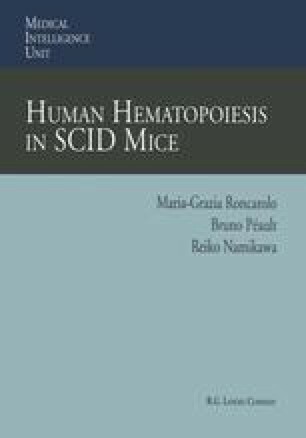 This chapter describes characteristics of SCID mice reconstituted with human lymphoid cells, mainly hu-PBL-SCID mice, with emphasis on parameters which may be relevant to humoral immunity.